Pocket-Console: I Heart Geeks to Release Soon, Maybe? I Heart Geeks to Release Soon, Maybe? 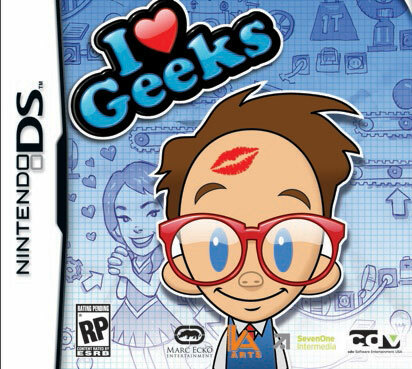 Anyone remember I Heart Geeks? Anyone? Didn't think so. I hardly remembered it, even after I re-discovered the official press release from cdv Software Entertainment way back in 2008. Even after I Google'd like mad in hopes of finding now ancient tidbits. Even after I found, and watched, the two video interviews discussing the title. I'm honestly surprised I can't recall the game, as Marc Echo is a collaborator on the title, though the concept of the game's major mechanic isn't exactly wow worthy. I Heart Geeks is a Rube Goldberg-style "I have a task to accomplish and a lot of little widgets to do so" game. The DS has seen more than a few titles of these kind, with Logic Machines and Mechanic Master immediately coming to mind. I kind of like these games, but heres the question that keeps tugging at me: "Why did this game take three years to make?" It's not as if it requires a huge amount of effort to design these puzzles, and considering the amount of time since it's announcement, I'm pretty sure one guy could have single-handily programmed the title in his spare time by this point. Maybe it'll be the best Rube Goldberg machine game ever? I guess we'll find out soon enough, that is if it actually gets released on the November 15, 2011 date listed over at Gamestop. Video and press release after the break, if your curiosity fancies. Cary, NC, July 17, 2008 – cdv Software Entertainment USA is pleased to today announce I Heart Geeks!, the ultimate puzzle experience that challenges players to create sophisticated and humorous contraptions using dozens of objects and the laws of real-world physics to solve over 100 brain teasers. I Heart Geeks! is slated for a September/October 2008 release on the DS. Produced in cooperation with Marc Ecko Entertainment, the game features a tongue-in-cheek story and hip art style where the brainy geek overcomes the brawny (and bullying) jocks, winning the heart of the beautiful cheerleader. A friendly interface and helpful tutorials along with the gradual introduction of puzzles of ever-increasing difficulty and complexity, multiple solutions, and wireless support to allow players to face off against one another in timed puzzle-solving races round out the features. "We are thrilled to work with Marc Ecko and his team to provide I Heart Geeks! With a hip art style and a tongue-in-cheek back story," said Mario Kroll, cdv USA's Director of Marketing and Public Relations. "This fits wonderfully with the accessible and maddeningly-addictive gameplay, as gamers of all ages try to solve physics-based puzzles and construct the most improbable machines." "Here at Ecko Entertainment we were instantaneously hooked to the unique game mechanic of the original European product, and realized that we wanted to be part of the effort that brought this great title to the states." said Marc Fernandez, Vice President of Marc Ecko Entertainment. About cdv Software Entertainment USAcdv Software Entertainment USA, a wholly owned subsidiary of cdv Software Entertainment AG, is a leading publisher of third-party video games and interactive entertainment with offices in New Jersey and headquarters in Cary, North Carolina. cdv Software Entertainment USA has published critically acclaimed and commercially successful titles including Divine Divinity, Blitzkrieg, American Conquest, Codename: Panzers, City Life, DarkStar One, War Front: Turning Point and Sherlock Holmes: The Awakened. The company will continue to expand its offerings with upcoming titles including the highly anticipated Sacred 2: Fallen Angel. For more information, please visit http://www.cdvus.com.